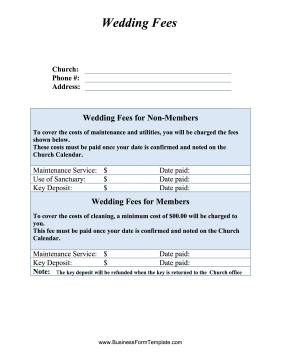 Perfect for rectory services helping couples planning their marriage, this free, printable church form lets non-members know about wedding fees. Sanctuary use, key deposit and maintenance service charges can be filled in by the parish. To cover the costs of maintenance and utilities, you will be charged the fees shown below. These costs must be paid once your date is confirmed and noted on the Church Calendar. To cover the costs of cleaning, a minimum cost of $____________________ will be charged to you. This fee must be paid once your date is confirmed and noted on the Church Calendar.